Six key communication tips for job interviews. In your interview focus on establishing a good rapport with your interviewer. Effective communication in a job interview is essential to your success. Often job interview communication will start off with some small talk, asking questions about getting to the interview, the weather and so on. Respond appropriately in a conversational tone but avoid over-communicating. Stay clear of problems or negatives such as describing how bad the traffic was. Have a couple of polite conversational-type remarks ready for this small talk phase, for example comment positively on the building or surroundings. You can prepare these while you wait for the interviewer. Make sure you know how to pronounce all the names correctly. Ask the receptionist beforehand if you are unsure of how to pronounce any names. It is advisable to address the interviewers formally until they suggest otherwise. Avoid abbreviating the interviewer's name unless asked to. For example if his name is Robert don't start calling him Bob! Important tips for job interviews include matching your communication style to that of the interviewer. If the interviewer is very business-like, then you should respond in a similar way. Avoid offering up jokes and funny stories. If the interviewer is more informal and chatty, adjust your communication style accordingly by responding in a more informal tone while still showing respect. The interviewer should be the one who sets the tone of the interview, not the candidate. A good interviewer will attempt to put the candidate at ease, don't interpret this as trying to be your friend! Always treat the job interview as a professional meeting. A common mistake candidates make is talking too much. Listen to the question being asked, ensure you are clear as to what is requested and respond with the information. It is easy to move off the subject and chatter about irrelevant topics. Effective communication means keeping your answers concise and to-the-point and making sure you are answering what is asked. "So you would like me to tell you about ...."
The interviewer can then correct you if you have misunderstood. There is no need to fill up silences with unnecessary rambling. Silences will naturally occur as the interviewer gathers their thoughts or formulates the next question, it is important to be comfortable with silences. 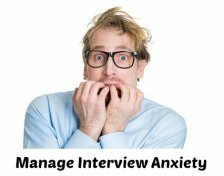 Interview anxiety can cause candidates to talk too much. Overcoming interview nerves will help you to communicate effectively during your job interview. One of the most important communication tips for job interviews is to avoid interrupting the interviewer. Make sure they have finished speaking before you respond. You can do this by allowing a pause before you start speaking. Taking a little time to think about a question rather than rushing to answer also helps you to organize your thoughts and prevents verbal fillers such as "umm" and "you know". These type of comments always come across as unprofessional. By taking a moment to think before you answer you appear calm, confident and polite. Try not to use jargon in your answers or questions. The interviewer may be unfamiliar with the jargon, often jargon is company-specific. Using jargon does not make you sound knowledgeable in the interview, often it just sounds as though the candidate is trying to impress with no real substance to the content of what is being said. Speaking simply and coherently is the best way to establish rapport. Be aware of the interviewer's body language. It will quickly tell you when you are not getting your message across properly. If you see that the interviewer appears confused or distracted refocus the interview by asking a question such as: "Has that answered your question or is there something else you would like to know.."
Remember that your non-verbal communication is as important as your verbal communication. Be sure your interview body language sends the right message. Successful interview communication starts from the moment you enter the company. Make the right impression from the start. Find out how to improve your job interview technique by following these insider tips and advice. Good interview preparation the day before your interview helps to build your confidence. Confidence is an essential part of successful job interview communication. Poor communication is one of the most common job interview mistakes. Good communication includes asking pertinent and thoughtful questions in your interview. Prepare a list of questions to ask the interviewer. 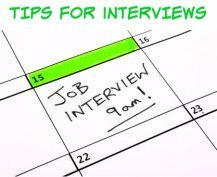 Closing the interview is key to getting the job. Using the right closing statements leaves a positive impression with the interviewer. 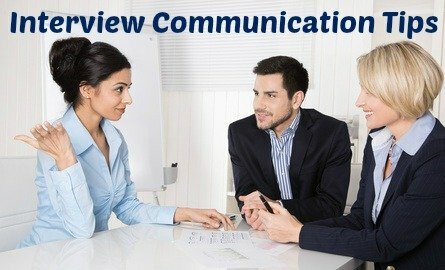 Interview communication skills are key to answering behavioral or competency-based interview questions successfully. View behavioral questions with sample behavioral interview answers. Skype interviews demand specific communication techniques. 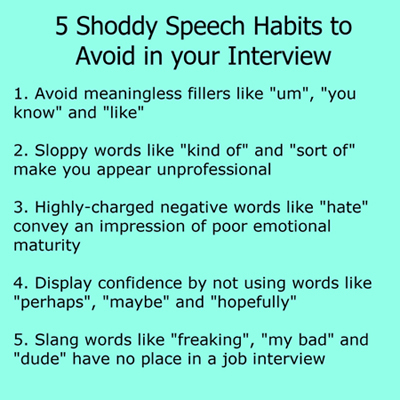 Find out more at Skype interview tips.